Vinita Sharma is a feisty teenager with a talent for writing, an out-sized crush on Shah Rukh Khan and the low ambition of marrying a rich guy (if Shah Rukh is taken, that is). Her brother Vinay is grappling with overactive hormones, IIT entrance exams and cricket practice, while Vinita is busy with her motley crew of friends- the angelic Naina, Jaggu the house clown, Ashley the inscrutable, and the bold and seductive Gargi. In a matter of weeks, Vinita's world changes radically. Her home-bound mother decides to set up a business, Naina and Vinay start to make goggle-eyes at each other, Jaggu examines his own shameful attitudes and Gargi reveals a dreadful secret that could destroy her whole life. Into this simmering emotional cauldron falls an American dude- the dashing Marcus- the boyfriend Vinita always dreamed of. As she swings wildly between her traditional way of thinking and what she really wants, Vinita takes crucial decisions that will surprise them all- most of all, herself. Can Vinita stay upright in a topsy-turvy world fraught with far reaching changes? Find out in this breezy candid diary. It really is curious that they call it M.P.B.C., as if that's all we learn. We do have another subject- it's called 'English'. But no one mentions it. As if it's unimportant. It's not! It's the most fun of all classes. 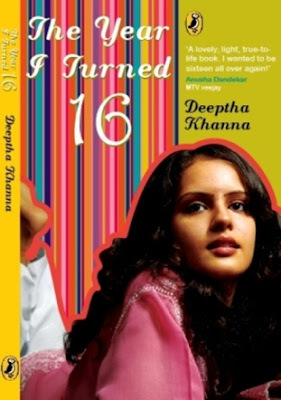 It may not be one of it's kind, but The Year I Turned 16 is definitely a book that will stay on your mind because it remains loyal to the teenage drama that an average Indian girl generally goes through. Interestingly, instead of the hype regarding social networking sites and the latest modern gadgets, over here we find the protagonist and her friends going gaga over the miracle of color television, MTV and The Oprah Winfrey show. Vinita is a character that one can easily come to adore- her bubbly, outgoing nature will win you over; the loving and helpful Naina is the best friend anyone would love to have; Jaggu adds to the comic element but also helps bring certain things into perspective. Marcus- do I have to say the words?- is Mr.Perfect with his drop dead gorgeous looks and gentlemanly manners. Ashley is someone who takes some time to grow on you; I did end up admiring him for being who he is, but it's still kind of hard to digest the fact that Ashley is the name of a guy. The story basically revolves around Vinita's crush on Marcus and her cute- and sometimes enormously embarrassing- attempts to impress him. Then there are the day-to-day activities of the characters which will bring back memories of school. (In fact, some of Vinita's short essays written in class are also included.) However, a number of issues are also focused upon: peer pressure, eve-teasing, the problems associated with balancing the time devoted to a woman's career with the time given to her family. Gargi's secret is possibly the most worrisome. All of it is taken into account in such a manner that it influences you without really depressing you. In fact, it seems you touch you more closely because at a certain point, this will cease to be just a story and will seem to be like a friend's diary, or even your own. Vinita's relationship with her brother is particularly endearing, and the unexpected ending is quite pleasing. A better version of the Princess Diaries, if I may say so, this novella about an Indian girl eagerly approaching her sixteenth birthday will make a light and amusing read. Reminds me of "a bowlful of butterflies" that I read and reviewd last year .. I guess I will want to try this ..